In The Architecture of Community, a brilliant, baffling book that contains equal parts text and the architectural equivalent of political cartoons, traditionalist architect Leon Krier opens with a simple proposition. Imagine that you had to choose between eliminating every building built before 1945 or every building built after 1945. Which would you choose? The total built volume of both periods is about the same—so which act of destruction would feel like the greater loss? This proposition is fascinating because it should be a hard question, but it isn’t. Our guts immediately tell us that a world full of postwar buildings would be alienating and hollow, utile but sterile. We lean on our pre-war buildings for far more—for meaning, for beauty, for a sense of place, for the stuff that makes life not merely livable, but worth living. This is Krier’s point. Modern architecture attempted to make a clean break with the past and “start from zero.” But for most ordinary people, the result has been the opposite—an unprecedented dependence on our architectural heritage as a refuge from our architectural present. Whenever anyone bothers to ask the American people about what kinds of buildings they prefer, they speak with a clear voice: They prefer traditional ones. In 2006, the American Institute of Architects decided to survey the general public for their view on the question, producing a ranked list of “America’s Favorite Architecture.” The list is remarkable: Of the 50 most favored buildings, a mere seven were built in postwar styles. Of those seven, two are monuments (the Vietnam Veterans Memorial and the Gateway Arch) and another, the World Trade Center, no longer exists. The other four are Frank Lloyd Wright’s Fallingwater, the Rose Center for Earth and Space, Chicago’s Willis Tower, and, inexplicably, Las Vegas’ Bellagio casino. The remaining 43 most favored buildings all hale from the prewar period. Perhaps the public will eventually come around to the new stuff, but it’s been 70 years. Various other types of evidence corroborate the clear public preference for traditional architecture. And what it all reveals is a stark disconnect between what ordinary people like and what actually gets built. When famous architects build today, their intended audience is not really the general public, or even the client. It’s other architects. It’s the people who award the Pritzker Prize. It’s the academics, theoreticians, and highly-credentialed practitioners who dwell in the impregnable temple of architectural criticism. The results are bizarre. For thousands of years, we built beautiful things. It is close to impossible to find a pre-20th century building capable of conjuring strong negative feelings—the worst they can evoke is indifference. But with the architect-theoreticians at the helm, we have succeeded for the first time at producing buildings that make people feel things like confusion, dread, anomie, and helplessness. I’m sitting here in The Queen Mary Pub in a small town deep in South Florida, on the fringes of the Everglades. It’s nearly midnight and I find myself alone at the bar reading C.S. Lewis’s “Perelandra.” A few inches away, my glass of London Pride finds itself nearly missing. It’s been a pleasant evening, one of those where the bar isn’t too crowded, and even with mostly college students ordering pitchers an aura of warm feelings and consciousness soaks the place. “I’m going to grab her ID,” replies his colleague decisively. “I mean, ask for it,” she quickly corrects herself. It turns out the girl doesn’t have her ID with her. She’s asked to leave. Her friends at their table are left to finish the night without her, and she’ll be walking home alone. I feel for this girl who was made to leave, even if she wasn’t of legal age. Because despite doing no concrete or true harm to anyone here among us, one among us was compelled to do a concrete harm to her evening. In law, there’s a general idea that a case can’t be judged unless actual harm has come to some party. Law is not meant to be decided abstractly—which is why we have philosophy. In the case of the girl here at the pub, from whose company we’re now the poorer, there was no harm. Even presuming she was, in fact, underage, my barman had been watching her. She was enjoying good company even if not good spirits. Even if she was underage, no genuine harm was done to anyone. And yet, our culture has developed in such a way that we send her away anyway. An abstract law protecting abstract principles occupies a higher place than the barman exercising his own discretion. In a sense, we’re no longer in some out of the way place on the fringes of a national preserve. In the act of eliminating discretion, a barkeep became an agent of Tallahassee, the Florida capital. She became an agent of something other than her own conscience, disrupting private fellowship for an abstract principle. We become poorer people as our chances to exercise discretion—to personally decide how a principle might best be applied in a particular situation—disappear from our culture. In a constitutional culture constructed to favor the concrete and local culture of a place over the distant and abstract sentimentality of a state or federal capital, it only makes sense to leave as much room as possible for acts of discretion. Just as “one size fits all” rarely suits fashion, it certainly doesn’t suit our cultures and communities well, because it frustrates their ability to be authentically unique, special places. It makes them like anyplace else. And it feels more and more difficult to go anyplace anymore that anymore feels like any special place. Anyway, back to my Lewis and London Pride. A look back in time to a different Philadelphia, this is the Pennsylvania Railroad ferry terminal at Market Street, circa 1908 and courtesy of the Library of Congress. The instant I saw this, I thought of the iconic San Francisco Ferry Building. Now, it doesn’t look like Philadelphia’s ferry building was constructed with anywhere near the degree of beauty or care for permanence that San Francisco’s was. I’m basing this purely from what I know of San Francisco’s compared to this photo. Maybe I’m wrong. In any event, absorbing this photo is an instance when you’re hit with L.P. Hartley’s insight that “the past is a foreign country.” Philadelphia’s ferry building disappeared, of course, replaced by Penn’s Landing’s sprawling parking lots and highway ramps. Replaced by desolation, in other words. And across the river Camden is an entirely different place—almost everything on that waterfront is gone. Independence Hall at Chestnut Street, circa 1910. I think this would have had to have been taken from the top of the American Philosophical Society at 5th & Chestnut Streets. This comes from the Library of Congress. It’s amazing to look at this scene of an earlier Philadelphia and see how different this section of Old City was a century ago. There was no “Independence Mall” yet, and Independence Hall was just a part of the fabric of the neighborhood—not yet something set apart from the city in such a fundamentally distinct way as it is now. City Hall, filthy, can be seen in the distance. Other than that, there’s not much in this photo that the contemporary Philadelphian would recognize. It’s fascinating to think about the entire lived experience of so many in the buildings that were eventually destroyed to create Independence Mall—entire lives, entire histories took place there. In the typical war of words over the positives and negatives of suburbanization we’re left with the binary of “cities v. suburbs,” where the fractured, isolated, idyllic suburban life is compared to the dense, plagued, teeming urban environment. This is problematic because it ignores the real problem with suburbs, which is that they don’t hurt our cities nearly as much as they hurt our towns. Specifically, the towns they’re nearby and sucking the life out of by pulling away residents and draining civic worth away from and into disjointed geographic spaces. College towns are particularly magical because they’re often survivors in terms of places where real small town America still exists. The Bedford Falls of It’s a Wonderful Life exists in our cultural consciousness as a cute and magical place. But our sentimentalism is rooted in the knowledge that those kinds of towns really were the norm rather than the silver screen exception—places where the owners of the local shops lived in town, and where the banker, policeman, and taxi driver were best friends in no small part because they lived down the street from each other. Suburbs kill dynamism because they fragment people, families, and communities that could have existed as towns. Cross pollination, randomness, and locality aren’t possible in these physically stretched out places. The Millennium Science Complex at Penn State University was put up a few years ago as a flagship research center. It was purposefully designed so that scientists, researchers, etc. from different areas and with varying focuses would “run into each other,” as a former trustee describes it to me a while ago. It was designed specifically so people and their ideas would intermingle and cross-pollinate, hopefully bearing research fruit as a result. This is what small towns once did that suburbs cannot—provide space and context for chance and relationships. American cities are thriving. But our small towns that are evaporating, and suburbanization is a driving force. I think Philadelphia’s Mural Arts Program is one of the best programs of its kind in the country. I know some call Philadelphia a “city of murals.” It’s true they seem to be everywhere. These are beautiful things. But it’s also true that the existence of most murals (like the one here) is possible only because of the failure of our architecture. What McClanahan’s built was a structure with a hideous and worthless blank wall that contributed to the deadening of a key portion of a main artery of the town. The mural above, like most opportunities for grand murals that I’ve seen, are creative responses to failure. They should be celebrated for what they are, and for the stories they tell. They should also be a call to our architectural and civic sensibilities to start building structures that are themselves works of art. Another little place with a woods existed nearby, maybe a ten minute walk. 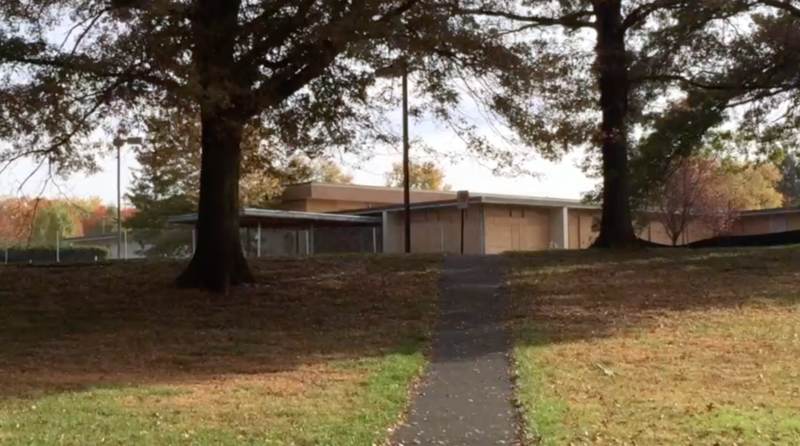 I think it used to be called the Hart School, but by the time I came onto the scene it had become the WREC—Warminster Recreation & Education Center. It was one of those places where dozens of neighborhood kids went to hang out on summer afternoons. Playing basketball, maybe. Attending a summer camp of some kind. Playing or riding bikes or loitering. A barely managed and unstructured place where a childhood took shape. It worked, and my own childhood would’ve been poorer without it. Like a release valve in bad times, and a Central Park in miniature for kids who’ve never been. It was a great, if increasingly decrepit, place. It was a part of the neighborhoods around it, and connected them in the way good public spaces do. What the township offers in its place is a managed park, a former Army base, miles away. It will require kids to be driven, which means it will be a scheduled event, which means it offers nothing of the character of the WREC that’s been replaced, which is a tragedy in miniature for the generations to come in the place I grew up.